Although IIH is, by definition, idiopathic, increased ICP can be caused by increased cerebrospinal fluid (CSF) production, reduced CSF absorption, increased cerebral venous pressure, venous sinus stenosis, increased brain water content, or a combination of these mechanisms.2 One theory has postulated elevated intracranial venous pressure as both the primary mechanism and a final common pathway for IIH. This theory is supported by the similar clinical appearance of IIH and secondary intracranial hypertension due to cerebral venous thrombosis and other causes of obstructed venous outflow. • Papilledema is the hallmark sign of idiopathic intracranial hypertension and occurs due to raised intracranial pressure transmitted to the optic nerve sheath. • Patients with papilledema should be evaluated for an intracranial cause. Papilledema is the hallmark sign of IIH. It occurs due to raised ICP transmitted to the optic nerve sheath. The elevated pressure, in turn, disrupts the axoplasmic flow within the nerve, resulting in swelling of the axons and leakage of water, protein, and other cellular content into the extracellular space of the optic disc, leading to optic disc edema.14 Although typically bilateral and symmetric, papilledema in the setting of IIH may be asymmetric or frankly unilateral; in one series of 478 IIH patients, 10% had highly asymmetric papilledema and greater visual loss in the eye with the higher grade of papilledema.15 In addition, the absence of papilledema does not exclude elevated ICP. Figure 1. A-scan ultrasonography can be a useful diagnostic tool. Reduction by greater than 20% on eccentric gaze (30° test), as shown above, indicates increased subarachnoid fluid level surrounding the optic nerve. Figure 2. B- and A-scan ultrasonography of optic disc drusen. Note that the optic nerve head is highly reflective. Calcified drusen leading to pseudopapilledema maintain high signal intensity, whereas the signal intensity is decreased in the setting of papilledema. Patients who do not respond to maximal medical treatment, who are noncompliant, or who are intolerant to medication may benefit from surgical intervention. Optic nerve sheath fenestration (ONSF) has been shown to reverse optic nerve edema and may lead to some recovery of optic nerve function. ONSF has also been shown to be safe and effective in children and could be an option for patients with IIH with predominantly visual symptoms,25,26 especially those with fulminant IIH with rapid deterioration of visual fields. Central acuity can be preserved until final stages and should not be used alone as a guide to decide on the necessity of surgical management. Patients with papilledema should be evaluated for an intracranial cause. Negative neuroimaging (eg, cranial, contrast MRI with magnetic resonance venography); normal CSF content; and an elevated ICP on opening pressure on lumbar puncture establish the diagnosis of IIH. Treatment with weight loss and acetazolamide is the first step in the treatment of IIH. Some patients who do not respond to maximum medical therapy may require surgery, such as ONSF, CSF diversion, or venous sinus stenting. 1. Friesner D, Rosenman R, Lobb BM, Tanne E. Idiopathic intracranial hypertension in the USA: the role of obesity in establishing prevalence and healthcare costs. Obes Rev. 2011;12(5):e372-e380. 2. Biousse V, Bruce BB, Newman NJ. Update on the pathophysiology and management of idiopathic intracranial hypertension. J Neurol Neurosurg Psychiatry. 2012;83(5):488-494. 3. Vischi A, Guerriero S, Giancipoli G, Lorusso V, Sborgia G. Delayed onset of pseudotumor cerebri syndrome 7 years after starting human recombinant growth hormone treatment. Eur J Ophthalmol. 2006;16(1):178-180. 4. Friedman DI, Gordon LK, Egan RA, et al. Doxycycline and intracranial hypertension. Neurology. 2004;62(12):2297-2299. 5. Friedman DI. Medication-induced intracranial hypertension in dermatology. Am J Clin Dermatol. 2005;6(1):29-37. 6. Condulis N, Germain G, Charest N, Levy S, Carpenter TO. Pseudotumor cerebri: a presenting manifestation of Addison’s disease. Clin Pediatr (Phila). 1997;36(12):711-713. 7. Dave S, Longmuir R, Shah VA, Wall M, Lee AG. Intracranial hypertension in systemic lupus erythematosus. Semin Ophthalmol. 2008;23(2):127-133. 8. 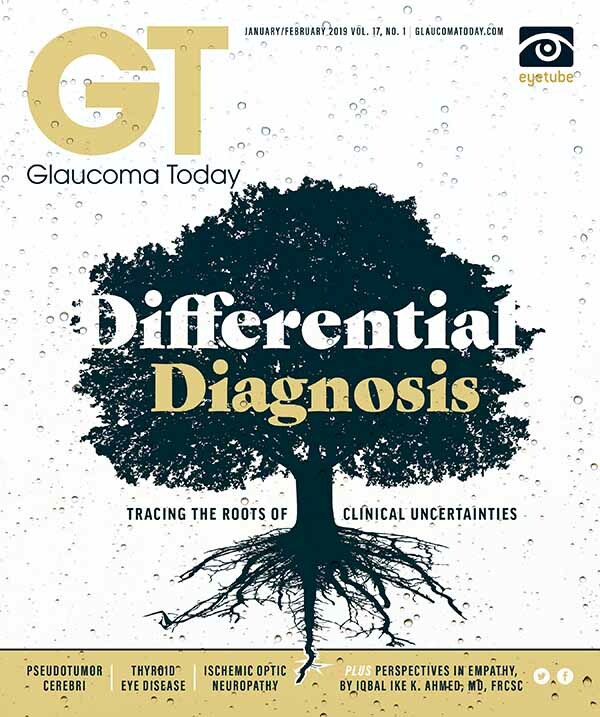 Glueck CJ, Iyengar S, Goldenberg N, Smith LS, Wang P. Idiopathic intracranial hypertension: associations with coagulation disorders and polycystic-ovary syndrome. J Lab Clin Med. 2003;142(1):35-45. 9. Wall M, George D. Idiopathic intracranial hypertension. A prospective study of 50 patients. Brain. 1991;114:155-180. 10. Friedman DI, Rausch EA. Headache diagnoses in patients with treated idiopathic intracranial hypertension. Neurology. 2002;58:1551-1553. 11. Sadun AA, Currie J, Lessell S. Transient visual obscurations with elevated optic discs. Ann Neurol. 1984;16:489-494. 12. Sismanis A, Butts FM, Hughes GB. Objective tinnitus in benign intracranial hypertension: an update. Laryngoscope. 1990;100(1):33-36. 13. Friedman DI. Pseudotumor cerebri. Neurol Clin. 2004;22(1):99-131. 14. Minckler DS, Tso MO, Zimmerman LE. A light microscopic, autoradiographic study of axoplasmic transport in the optic nerve head during ocular hypotony, increased intraocular pressure, and papilledema. Am J Ophthalmol. 1976;82(5):741-757. 15. Wall M, White WN 2nd. Asymmetric papilledema in idiopathic intracranial hypertension: prospective interocular comparison of sensory visual function. Invest Ophthalmol Vis Sci. 1998;39(1):134-142. 16. Mollan SP, Markey KA, Benzimra JD, et al. A practical approach to diagnosis, assessment and management of idiopathic intracranial hypertension. Pract Neurol. 2014;14:380-390. 17. del Saz-Saucedo P, Redondo-Gonzales O, Mateu-Mateu A, et al. Sonographic assessment of the optic nerve sheath diameter in the diagnosis of idiopathic intracranial hypertension. J Neurol Sci. 2016;361:122-127. 18. 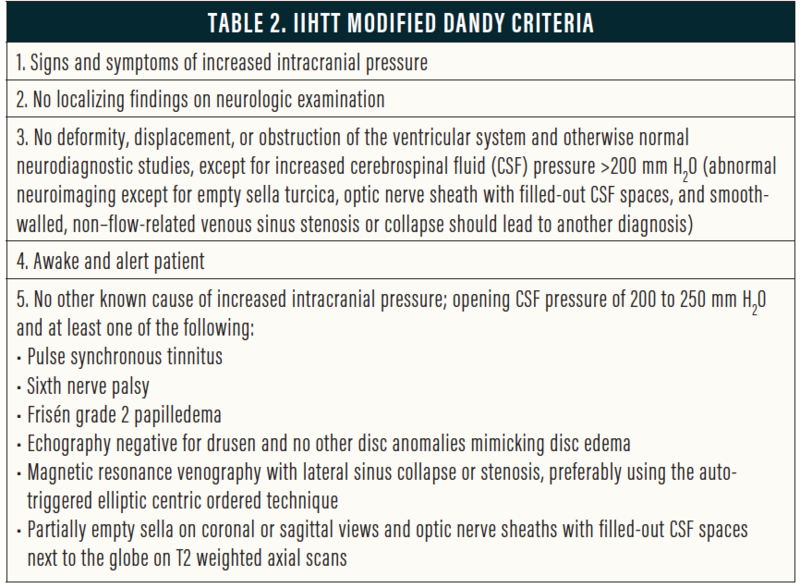 Wall M. The modified Dandy criteria for idiopathic intracranial hypertension, no need to fix what is not broken. Neurology. 2004. 19. Subramaniam S, Fletcher WA. Obesity and weight loss in idiopathic intracranial hypertension: a narrative review. J Neuroophthalmol. 2017;37(2):197-205. 20. Manfield, JH, Yu KK, Efthimiou E, et al. Bariatric surgery or non-surgical weight loss for idiopathic intracranial hypertension? A systematic review and comparison of meta-analyses. Obes Surg. 2017;27(2):513-521. 21. Mollan SP, Davies B, Silver NC, et al. Idiopathic intracranial hypertension: consensus guidelines on management. J Neurol Neurosurg Psychiatry. 2018;89(10):1088-1100. 22. Kesler A, Hadayer A, Goldhammer Y, et al. Idiopathic intracranial hypertension: risk of recurrences. Neurology. 2004;63:1737-1739. 23. ten Hove MW, Friedman DI, Patel AD, et al. Safety and tolerability of acetazolamide in the Idiopathic Intracranial Hypertension Treatment Trial. J Neuroophthalmol. 2016;36(1):13-19. 24. Celebisoy N, Gökçay F, Sirin H, Akyürekli O. Treatment of idiopathic intracranial hypertension: topiramate vs acetazolamide, an open-label study. Acta Neurol Scand. 2007;116:322-327. 25. Lee AG, Patrinely JR, Edmond JC. Optic nerve sheath decompression in pediatric pseudotumor cerebri. Ophthalmic Surg Lasers. 1998;29:514-517. 26. Spitze A, Lam P, Al-Zubidi N, et al. Controversies: optic nerve sheath fenestration versus shunt placement for the treatment of idiopathic intracranial hypertension. Indian J Ophthalmol. 2014;62(10):1015-1021. 27. Farb RI, Vanek I, Scott JN, et al. Idiopathic intracranial hypertension. Neurology. 2003;60(9):1418-1424. 28. Gates P, McNeill P. A possible role for temporary lumbar drainage in the management of idiopathic intracranial hypertension. Neuroophthalmology. 2016;40(6):277-280.